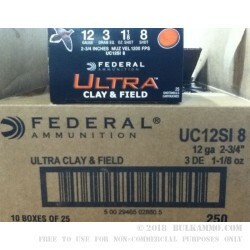 This is a 250 round case of Federal Clay & Field ammunition that is a spectacular value that many may not recognize on the surface, but as you dive deeper into the structure and makeup of the shell, you realize the important features and that Federal truly can leverage big volume, great R&D across many lines of ammunition and the power of their physical production facilities. 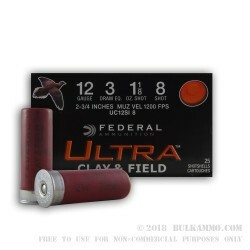 In the case of this 2 ¾” shell, which houses a #8 shot, you are getting so much more than a standard practice round, you are getting a lead based, highly performing target round that also has the higher payload value to help with the extra downed clays and the growing small game harvest that the load is capable of. The load features a 1 1/8 ounce payload of the versatile #8 shot size that is suitable for most small game to about the size of a coyote. In certain circumstances it is the obvious go-to load. This shell is usable in any mainstream shotgun, and the only caveat, which is nitpicky at best, is the low brass base, which is actually a galvanized steel component. This makes reloading more difficult and some finicky guns harder to use with the ammunition, but it is not a major factor for 99% of the firearms you would shoot this load in. 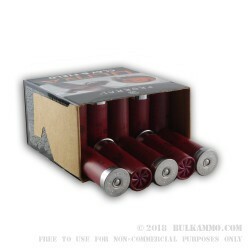 the ammo i bought was very cheap and very reliable and the website was very well put together and easy to navigate.